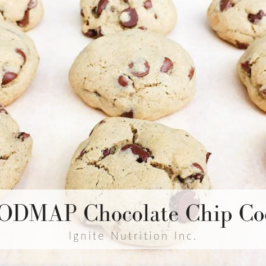 Low FODMAP Chocolate Chip Cookies | Ignite Nutrition Inc. I often find that people either love potlucks or hate them. Either you know the perfect dish to bring, or you spend hours worrying about what is an acceptable dish to bring. You ask yourself: what is considered a big enough portion? Are people going to like the dish I bring? Does it have to be homemade, or is it acceptable to opt for some store bought snacks? Although potlucks are supposed to be a fun get together, they can often be more stressful than desired. 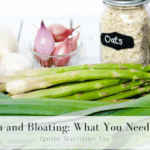 In addition when trying to stick to a low FODMAP diet, a whole new layer of stress is added. It can be difficult to distinguish which platters are low-FODMAP and which are not. Especially when your co-worker won’t share that secret ingredient to her Grandma’s cookies! That is why I want to share this low-FODMAP (and gluten-free) chocolate chip cookie recipe with you! 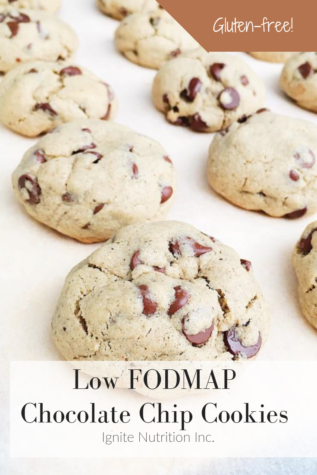 You can bring them to the next potluck you attend and know that if FODMAP compounds are a concern for you, these cookies shouldn’t give you any trouble! I personally like to bring something to a potluck that I know I will enjoy myself, so if I am limited by the options present, I know that there is at least one dish I can indulge in! I hope that these cookies can serve as that dish for you! These cookies are very similar to the classic wheat flour chocolate chip cookies, but they are made with buckwheat flour. 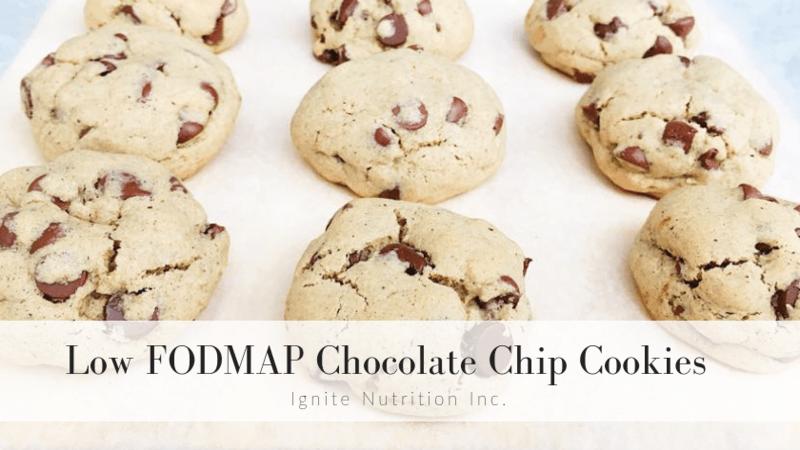 Buckwheat is a whole grain, low-FODMAP, and gluten-free alternative to wheat flour – perfect for making low FODMAP chocolate chip cookies! Gluten Free Note: if you are making these for people with celiac disease – you’ll want to ensure the flour is certified gluten free, or does not say ‘may contain gluten’ or ‘made in a facility that processes gluten’ – some brands of buckwheat flour may have this on the label due to risk of cross contamination when processing in certain facilities. Thanks to Terri Guss, at The Spruce Eats for their delicious cookie recipe using buckwheat. The cookies turned out extra soft and easily fell apart in your mouth! 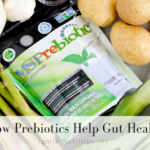 I can confidently say they are a great Low FODMAP alternative to the classic recipe. Next time you get invited to a potluck, ensure that you can enjoy some of the platters there and whip up a batch of these cookies! Preheat oven to 375 F and grease a large baking sheet with butter or line with parchment paper. In a large bowl, using a spoon or electric mixer blend the egg and then add butter, brown sugar, vanilla extract. Mix until smooth. In a medium bowl, mix buckwheat flour, baking soda, and salt. Gradually add the dry ingredients to the wet ingredients and stir until completely mixed. Lightly mix in the chocolate chips. Roll dough into small balls about golf ball size and align on baking sheet. Cook for 9-11 minutes, until the edges are golden brown.